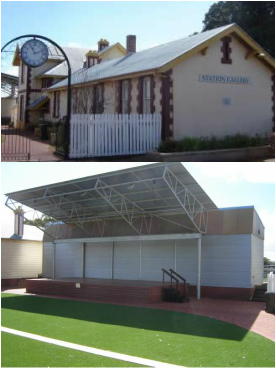 ﻿Beverley Station Gallery and Platform Theatre is a multi-purpose cultural precinct in the centre of the Wheatbelt town of Beverley adjacent to the railway. ​Built in 1886 in the Victorian Tudor style, the Beverley Railway Station was the hub of activity when Beverley was an important stop on the Perth to Albany passenger line. Closed in October 1984, the Railway Station fell into disrepair, but after much hard work by both the community and council was beautifully restored in 2006. In 2007, the Beverley Railway Station was the winner of the Heritage Council of Western Australia award for the Conservation of a place on the State Register of Heritage Places. The Railway Station now displays the Beverley Council Art Collection and you can also buy work by local artists or talk with an artist in residence. Venture beyond the gallery to the Platform Theatre and see the amazing amphitheatre​ and stage, where many of the summer events are held in Beverley​. The Beverley Art Prize is an annual art exhibition that is open over the Easter long weekend. The overall winner prize money is $5,000. To become a friend of the Beverley Station Arts group, download your membership form.